A Movement Request is required to be submitted to the Duty Reporting Officer a minimum of 24 hours prior to arrival for all aircraft for Department of Defence Approval. Operators nominating Learmonth as an International Alternate must submit an alternate request and DCP for approval by Department of Defence. The Request form must be accompanied by a letter (on company letterhead) requesting approval and be submitted to the duty reporting officer. Note that provision of Ground Servicing Equipment is the responsibility of the airline. Limited GSE is available for larger aircraft. There is no ARFF service available at Learmonth Airport. For RPT operators granted Licenced Operator Status by the Department of Defence, you are reminded that any changes to schedule must be advised in writing (on Company Letterhead) 10 days prior to commencement of schedule change. Learmonth Airport is a Security Controlled Airport. Display of ASIC is required at all times. Photography is not permitted at any time on the airfield or within the terminal. There is 1 main runway at Learmonth Airport. The main runway (Runway 18/36) is 3047m long and 45m wide with a PCN of 43/F/A/1750(254psi)/T. Taxiway Whisky (PCN 43/F/A/1750(254psi)/U) is the only taxiway to be used by civilian operations and is the only link to Learmonth Airport. 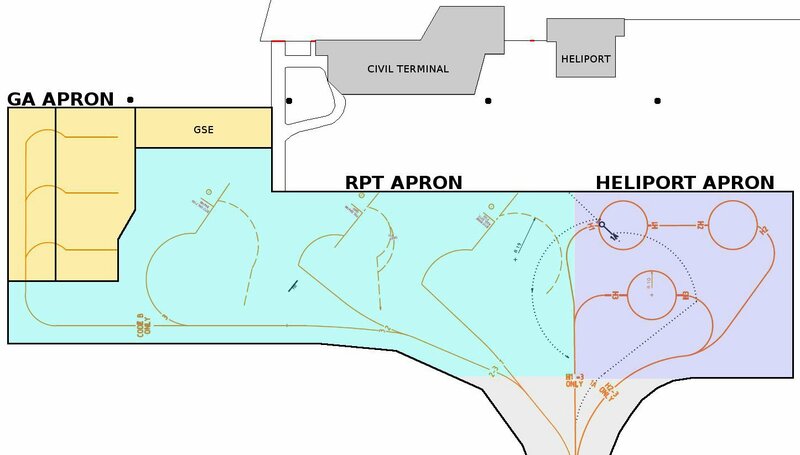 There are 3 distinct aprons at the Civil Terminal - RPT, GA and Helicopter. All aprons are accessed via taxiway Whisky. An alternative bay for larger aircraft may be available but only under strict operational conditions. For further information contact the Duty Reporting Officer. on the GA apron is restricted to aircraft up to Code B. Space is limited for General Aviation aircraft parking and prior parking approval is required. The Helicopter apron has 3 helicopter hot spots and is restricted to approved helicopter charter operators only. For further information contact the Heliport Coordinator on 0427 744 153 or heliportops@exmouth.wa.gov.au. CTAF-AFRU 118.3 (R) except when Learmonth air traffic control and restricted areas are active. High Intensity runway lights and PAPI are available with a Category 1 HIAL for runway 18. Apron lighting activates on PAALC. VHF Omni Range (VOR) radio aids to pilots. ATC may be in operation during military operations. Refer to current NOTAM information. Otherwise, there is no ATC facility at Learmonth Airport. There is no rescue and fire fighting service provided at Learmonth Airport.